The term Dakota Group (Meek and Hayden, 1862) was first applied to the varicolored clay, sandstone, and lignite beds beneath the Benton Group in exposures near Dakota City, Dakota County, Nebraska. The use of this grouping has been discontinued (Plummer and Romary, 1942), and the Dakota Formation now includes strata between the Kiowa Shale below and the Graneros Shale above. Character and subdivisions--The Dakota Formation consists of variously colored clays, dark-gray shale, sandy shale, and lenticular beds of siltstone and sandstone. Yellow-brown to brown ironstone and quartzitic sandstone characterize outcrops of the Dakota. Owing to the resistance of sandstone beds, the Dakota Formation in outcrop may appear to be mostly sandstone, but much of the formation is clay and shale. In Kansas the Dakota Formation has been divided into two members, the lower called the Terra Cotta Clay member and the upper called the Janssen Clay member (Plummer and Romary, 1942). In Mitchell County only the upper part of the Dakota Formation is exposed. Distribution and thickness--The Dakota Formation crops out along the Solomon Valley in the eastern part of Mitchell County and along the Salt Creek valley in the southeastern part (Pl. 1). In the rest of the county the Dakota Formation is concealed by younger overlying formations. Leonard (1952) determined the top of the Dakota Formation to lie at a depth of about 100 feet near Downs, just west of the Mitchell-Osborne County line. At a test hole drilled in the SW cor. sec. 8, T. 7 S., R. 5 W., in western Cloud County near the Mitchell County line, the thickness of the Dakota was about 350 feet (C. K. Bayne, personal communication). The Kiowa Shale, if present, could not be differentiated; no Cheyenne Sandstone was present, and Permian red beds were penetrated below 350 feet. Water supply--The Dakota Formation contains lenticular sand bodies that are sources of moderate supplies of water. In eastern and southeastern Mitchell County this supply is adequate for domestic and stock use (Fig. 17). In the rest of the county, to the west, water from the Dakota Formation is too mineralized for use. Water from the Dakota Formation in most of Mitchell County is under artesian pressure but rarely flows at the surface. Figure 17 illustrates the areas in Mitchell County where potable water is available from the Dakota Formation. The chemical character of water obtained from the Dakota is shown by analyses in Table 5 and graphically in Figure 14. Figure 17--Map of Mitchell County showing generalized areas where water in Dakota Formation is fresh. Ground water in Dakota Formation in unshaded areas is too mineralized for ordinary uses. Along the Solomon Valley in the eastern and central parts of Mitchell County, sand and gravel of the alluvial terrace deposits are underlain by the Dakota Formation. Water within the Dakota Formation is under artesian pressure, and under certain hydraulic conditions it contaminates the overlying fresh water. Water from terrace deposits is known to be salty at several localities in the Beloit area. Chemical analysis 7-7-15cbc (Table 5) of water from a well penetrating terrace deposits about a mile southeast of Beloit in the SW sec. 15 shows 2,000 ppm of chloride, 1,710 ppm of sodium, and 1,090 ppm of sulfate. Analysis 7-7-21bbb from a well obtaining water from terrace deposits about a mile south of Beloit in the NW sec. 21 also shows the water to be salty. Water too salty for domestic or stock use is present in the alluvial deposits south and southwest of Beloit in sec. 16, 17, and 18. An irrigation well drilled in March 1956 about 2 miles east of Beloit in the NE sec. 14 was reported to be too salty for use. Character--The Graneros Shale was named by Gilbert (1896) from exposures of marine shale along Graneros Creek, south of Pueblo, Colorado. The Graneros Shale is a noncalcareous dark-blue-gray clayey shale that weathers gray and tan. Included locally in the formation are interbedded thin layers of bentonite and thin lenses of ferruginous sandstone. Selenite crystals are common. The formation is soft and forms a gentle slope between the Dakota Formation and the Greenhorn Limestone. Distribution and thickness--The Graneros Shale crops out in the eastern and southeastern parts of Mitchell County, but because the formation is soft, good exposures are rare. The only outcrop in Mitchell County where an entire section of the Graneros Shale is exposed is in the SE sec. 24, T. 8 S., R. 6 W., where the shale is about 25 feet thick. Water supply--No wells in Mitchell County are known to obtain water from the Graneros Shale. A sandstone lens in the shale could yield water if penetrated below the water table by a well, but because of the low permeability of the sediments, the yield would be small. Character and subdivisions--Gilbert (1896, p. 564) named the Greenhorn Limestone from outcrops of interbedded limestone and shale near Greenhorn Station, south of Pueblo, Colorado. 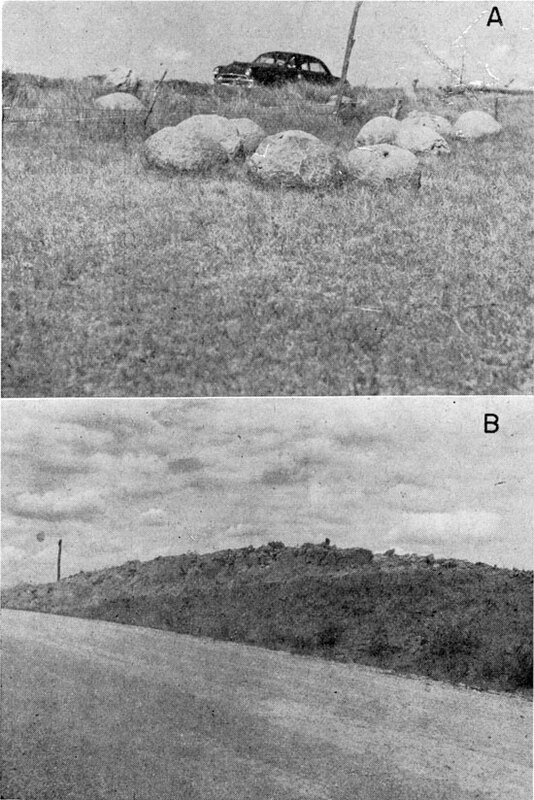 Central Kansas rocks referred to as "Benton" were correlated with the Colorado section of the Greenhorn by Logan (1897, p. 232). In Kansas, the Greenhorn Limestone is divided into four members (Rubey and Bass, 1925; Bass, 1926), which in ascending order are the Lincoln Limestone, Hartland Shale, Jetmore Chalk, and Pfeifer Shale members. The Greenhorn Limestone consists of interbedded chalky limestone and chalky shale, including some thin bentonite seams, and lies conformably between the Carlile Shale above and the noncalcareous Graneros Shale below. Plate 5 shows typical sections of the upper part of the Greenhorn Limestone. The top of the Greenhorn Limestone is marked by the Fencepost Limestone bed, which is a hard, dense limestone about 1 foot thick having an iron-stained layer near the center. The measured section below illustrates the lithology of the Greenhorn Limestone. Section of Greenhorn Limestone and Graneros Shale measured in quarry and road cut in SE sec. 24 T. 8 S., R. 6 W., by A. R. Leonard, C. K. Bayne, and K. L. Walters, August 13, 1953. Plate 5--A, Upper part of Greenhorn Limestone exposed in SW sec. 18, T. 7 S., R. 7 W. B, Greenhorn Limestone exposed in railroad cut in SW sec. 27, T. 6 S., R. 9 W.
The Lincoln Limestone, basal member of the Greenhorn Limestone, is about 22 feet thick in Mitchell County and consists principally of gray calcareous shale. Thin gray and orange bentonite seams and thin limestone beds occur irregularly within the member. The limestone beds are shaly and slabby except in the basal part, where they are hard, dark, and crystalline. Limestone beds in the lower part are generally petroliferous, giving off a petroleum odor when freshly broken. The Hartland Shale member of the Greenhorn Limestone is composed of about 26 feet of gray calcareous shale containing interbedded brown to orange bentonite seams and chalky limestone beds. The Hartland Shale member has a relatively obscure outcrop. The Jetmore Chalk member consists of alternating thin beds of chalky limestone and calcareous shale. The "Shell-rock limestone" bed marks the top of the Jetmore and forms a rocky hillside bench. The "Shell-rock limestone" bed is shaly, contains many Inoceramus shells, and is about 1 foot thick. The Jetmore Chalk member in Mitchell County is about 19 feet thick. The Pfeifer Shale, uppermost member of the Greenhorn Limestone, is about 19 feet thick in Mitchell County and consists principally of alternating beds of thin chalky limestone and calcareous shale. The limestone is concretionary and contains abundant Inoceramus shells. The shale is calcareous, fissile, and light gray. A few thin bentonite layers occur in this member at some localities. The top of the member is marked by the Fencepost Limestone bed, a hard chalky limestone about 1 foot thick having an iron-stained layer near its center. This bed, the thickest persistent limestone bed in the Pfeifer Shale member, is easily recognized by its creamy color, its uniform thickness, the iron-stained band, and the hillside bench it forms (Pl. 6A). The Fencepost Limestone bed has been quarried extensively in north-central Kansas for fence posts and building stone. Plate 6B shows building stone being quarried and cut from the Fencepost Limestone bed about 3 1/2 miles south of Simpson on the Mitchell-Cloud county line. Plate 6--A, Contact of Greenhorn Limestone and Carlile Shale 1.5 miles south of Beloit on Kansas Highway 14. Thick bed containing iron-stained band near middle of section is Fencepost Limestone bed, marking top of Greenhorn Limestone. B, Building-stone quarry in Fencepost Limestone bed in SE sec. 24, T. 8 S., R. 6 W., south of Simpson. Distribution and thickness--The Greenhorn Limestone is the most prominent bedrock formation in Mitchell County, but in many places it is concealed by the overlying Carlile Shale or by the mantle of eolian silt characteristic of the upland. The Fencepost Limestone bed and "Shell-rock limestone" bed form prominent rocky shoulders along hillsides where they are not masked by loess. The thickness of the Greenhorn Limestone in the SE sec. 24, T. 8 S., R. 6 W., measured 86.5 feet and is representative of the formation in Mitchell County. The areal distribution of the Greenhorn Limestone is shown on Plate 1. Water supply--The water-yielding capacity of the Greenhorn Limestone is low, but wells that intercept cracks and fissures or solution openings may yield small amounts of water. Nearly all wells obtaining water from the Greenhorn Limestone in Mitchell County are dug wells. In the upland area many rural domestic and stock wells obtain water from the Greenhorn Limestone, and during times of normal rainfall these wells are generally adequate. Because water in the Greenhorn Limestone is replenished by local rainfall, many wells obtaining water from this formation are dry during prolonged dry periods when the water level drops below the bottom of the well. Most of these wells probably would withstand dry periods longer before failing if they were deepened. Many farm wells in Mitchell County are dependent upon water from the Greenhorn Limestone, although where possible other sources of water such as the underlying Dakota Formation or the alluvial terrace deposits are used. The chemical character of water from the Greenhorn Limestone is shown by analyses in Table 5 and graphically in Figure 14. Character and subdivisions--The Carlile Shale was named by Gilbert (1896) from exposures of gray argillaceous shale along Carlile Creek, 21 miles south of Pueblo, Colorado. 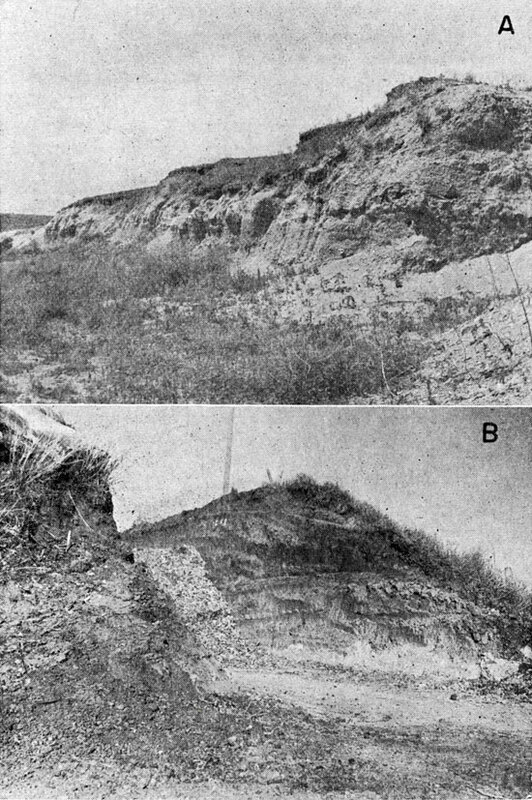 Logan (1897) correlated Gilbert's section with Cretaceous beds along Solomon River from Beloit in Mitchell County westward into Norton County. Rubey and Bass (1925) divided the Carlile Shale into two members, the Fairport (chalky shale) Member below and the Blue Hill Shale above. Bass (1926) named the Codell Sandstone zone in the upper part of the Blue Hill Shale member from exposures along Saline River in Ellis County, Kansas. The Fairport Member consists of alternating beds of calcareous shale and thin nodular chalky limestone. Ostrea shells are abundant. The limestones are soft and chalky; they are cream color to gray in fresh exposures and tan to brown in weathered exposures. The shale is chalky and contains thin bentonite seams near the base. The lower part of the member contains abundant chalky limestone beds and resembles the underlying Pfeifer Shale member of the Greenhorn Limestone. The Blue Hill Shale member is a noncalcareous gray to blue-black clayey shale containing abundant ordinary and septarian concretions and selenite crystals. Septarian concretions 3 to 4 feet in diameter containing crosscutting veins of brown calcite are common in the upper part of the member (Pl. 7A). The Codell Sandstone zone marks the top of the Blue Hill Shale member and crops out in the Blue Hills area. In Mitchell County the sandstone is about 2 to 3.5 feet thick. It is fine grained to silty and contains considerable clay; the color is characteristically yellow brown. Plate 7--A, Septarian concretions 3 to 4 feet in diameter common in the upper part of Carlile Shale, NW sec. 19, T. 19 S., R. 9 W. B, Contact of Carlile Shale and overlying Fort Hays Limestone member of Niobrara Formation, SW sec. 12, T. 9 S., R. 10 W.
Distribution and thickness--In Mitchell County the Carlile Shale is almost everywhere concealed beneath eolian silts of the Sanborn Group or, as in the Blue Hills southeast of Tipton, beneath the Fort Hays Limestone member of the Niobrara Formation. In the eastern part of the county the Carlile Shale is exposed in only a few places, where it caps some of the uplands in the interstream areas. In the western part of the county, particularly the southwestern part, exposures of the Carlile Shale are more extensive. The total thickness of the Carlile Shale is about 300 feet. The Fairport Member is about 100 feet thick and the Blue Hill Shale member, including the Codell Sandstone zone, is about 200 feet thick. Water supply--The Carlile Shale is impervious and does not yield water to wells in Mitchell County. The Codell Sandstone zone is well above the water table and yields no water to wells. A few wells in the Blue Hills area, where ground-water supplies are meager, obtain water from slope-wash deposits resting on slopes of the Carlile Shale. Character and subdivisions--The Niobrara Formation was named by Meek and Hayden (1862) from exposures of calcareous marl and chalky limestone near the mouth of Niobrara River in northeastern Nebraska. In 1897 Logan (p. 219) described the Niobrara in north-central Kansas and subdivided it into the Fort Hays Limestone member below and the Smoky Hill Chalk member above. He described a section of Cretaceous rocks in Mitchell County from Beloit to Tipton (Pl. 31, fig. 1). Williston (1897, p. 235) discussed the paleontology and stratigraphy of the Niobrara in western Kansas. 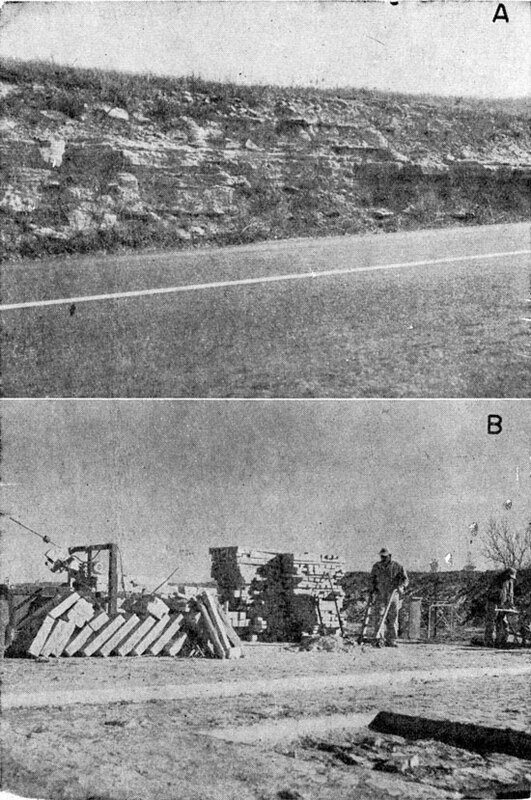 Landes (1930, p. 16) described the appearance and occurrence of the lower part of the Niobrara Formation in Mitchell and Osborne counties. In Mitchell County only the Fort Hays Limestone, lower member of the Niobrara Formation, is present. The Fort Hays Limestone member consists of thick to massive layers of soft chalky limestone separated by thin layers of chalky shale. The color ranges from creamy white to light brown. The beds of chalky limestone typically become platy when weathered. The contact of the Fort Hays Limestone member with the underlying Carlile Shale is marked by a distinct change from light-colored calcareous beds of the Fort Hays to the dark noncalcareous sand and shale of the Carlile Shale (Pl. 7B). Distribution and thickness--The Fort Hays Limestone member crops out in the Blue Hills area in the southwestern part of Mitchell County, where it caps the butte-like hills. The maximum thickness of the Fort Hays in Mitchell County is about 45 feet. Water supply--The Fort Hays Limestone member is well above the water table in Mitchell County and does not yield water to wells. Quaternary deposits in Mitchell County are of continental origin and are assigned to the Pleistocene Series. The deposits are both fluviatile and eolian and are composed of clay, silt, sand, and gravel. Fluviatile deposits are associated with the present drainage system or with ancient drainage systems. Eolian deposits generally mantle the upland but locally extend into the valleys and rest on older fluviatile deposits. The Pleistocene Epoch as defined by the State Geological Survey of Kansas is the last of the major divisions of geologic time and has been called the "Ice Age," owing to the presence of continental glaciers in North America and other parts of the world. The Pleistocene Epoch has been divided into four main glacial stages, the Nebraskan, Kansan, Illinoian, and Wisconsinan, and three interglacial stages, the Aftonian, Yarmouthian, and Sangamonian. Deposits of Quaternary age, although relatively thin in Mitchell County, are near-surface materials in much of the county, as shown by the geologic map (Pl. 1). Deposits of Nebraskan or Kansan age were not recognized in Mitchell County. Quaternary deposits are classed in this report as the Sanborn Group and Recent alluvium. The Sanborn Group includes deposits of Illinoian and Wisconsinan ages and is composed of the Crete Formation, silts of the Loveland and Peoria Formations, and terrace deposits. Because it is impracticable to differentiate between the Loveland Formation and the Peoria Formation in ordinary field mapping, these formations were mapped as a unit. The Crete Formation and the Wisconsinan terrace deposits were mapped separately. 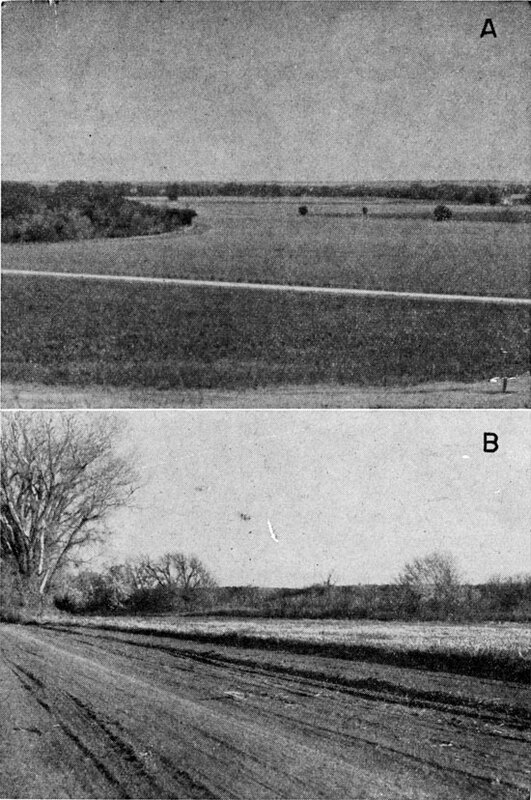 In 1931, Elias (p. 163) described unconsolidated late Pleistocene deposits consisting mostly of silt in northwestern Cheyenne County, Kansas, and named these deposits the Sanborn Formation. In 1944, Hibbard, Frye, and Leonard made a reconnaissance of Pleistocene deposits of north-central Kansas and concluded that the Sanborn in most of north-central Kansas consisted of wind-deposited silt. In 1947, Frye and Fent divided the Sanborn into three members, in ascending order the Loveland, Peoria, and Bignell Silts. This classification was modified by Frye and Leonard (1949) when they applied the name Crete to the sand and gravel underlying the Loveland Silt. In 1952, Frye and Leonard recognized the Crete (sand and gravel) Member, Loveland (silt) Member, early Wisconsinan alluvial deposits, Peoria (silt) Member, late Wisconsinan alluvial deposits, and Bignell (silt) Member within the Sanborn Formation. A Pleistocene conference was held in Lawrence, Kansas, on June 28-29, 1956, for the purpose of developing a correlative stratigraphic nomenclature for Pleistocene deposits of Kansas. Names of some formations and members were dropped and some other names were changed in rank. New names were selected to replace some that were dropped. The Sanborn was elevated to group rank and the Loveland, Peoria, and Bignell within the Sanborn were elevated to formational rank. In November, 1956, this classification of the Sanborn Group was modified by the State Geological Survey of Kansas, and the Crete was elevated to formational rank. In Kansas the Sanborn Group now includes, in ascending order, the Crete Formation, Loveland Formation commonly containing the Sangamon buried soil at the top, early Wisconsinan terrace deposits, Peoria Formation commonly containing the Brady buried soil at the top, late Wisconsinan terrace deposits, and Bignell Formation. Stream-deposited sand, gravel, and silt overlying Cretaceous bedrock and forming high terraces along the Solomon Valley and its larger tributaries represent the Crete Formation, of Illinoian age. The terrace is dissected, discontinuous, and in a position higher than the younger Wisconsinan terrace deposits that constitute the major part of the valley fill. Scattered remnants of the Crete Formation, most of which are being excavated for sand and gravel, are all that remain of these alluvial deposits. They are more numerous along the north side of the Solomon Valley and its tributaries from the north than they are along the south side. There are also several deposits along the Salt Creek Valley in the southeastern corner of the county, mostly along the north side of the valley. The Crete Formation consists of poorly sorted silt, lenses of sand and quartz gravel, and angular to partly rounded fragments of indigenous chalky limestone (Pl. 8A). The deposits are as much as 20 feet thick and grade upward into sandy silt, classed as the Loveland Formation. Unexposed sand and gravel deposits of the Crete Formation possibly underlie the Loveland and Peoria Formations at other places in Mitchell County. The Crete Formation is above the water table in Mitchell County and does not yield water to wells. Plate 8--A, Crete Formation, SW sec. 33, T. 8 S., R. 8 W. B, Pit silo showing eolian silts classed as Peoria Formation overlying Carlile Shale, SW sec. 11, T. 7 S. R. 8 W.
In the upland of Mitchell County, eolian silts form the most extensive outcrop, blanketing much of the county with a cover of loess ranging from a featheredge to more than 40 feet in thickness. Eolian silts in Mitchell County represent the Loveland Formation of Illinoian age and the Peoria Formation of Wisconsinan age. The Bignell Formation was not recognized in Mitchell County and if present is incorporated within the modern soil profile. Loess in Mitchell County occurs as an upland phase, in which it caps the rolling topography of the uplands, as well as a valley phase, in which it masks the valley walls of the larger streams. Colluvium, material deposited by slope wash and consisting of reworked loess and Cretaceous bedrock fragments, has been mapped with the Loveland and Peoria Formations where it is sufficiently thick to conceal the underlying bedrock. The Loveland Formation is a reddish-tan silt, in part eolian, at the top of which is the Sangamon buried soil. In much of Mitchell County the Loveland Formation is almost entirely within the Sangamon soil profile and consists of 2 or 3 feet of silt forming a fossil soil resting on the eroded surface of Cretaceous rocks. In places the pre-soil material seems to represent local slope-wash deposits consisting mostly of eroded Cretaceous rocks. The bulk of the upland silt mantle in Mitchell County consists of the Peoria Formation, which overlies the Loveland Formation. The Peoria Formation is a massive tan to gray-buff calcareous eolian silt that extends in an almost unbroken blanket over much of the upland (Pl. 8B). The deposits mapped as Peoria and Loveland Formations in this report consist mostly of relatively thin wind-deposited silts overlying Cretaceous rocks and are generally well above the water table. In the southwestern part of Mitchell County and in parts of the upland of the county where ground-water supplies are meager, however, shallow wells obtain some water from colluvial and slope deposits classed as Sanborn Group in this report. Character and extent--The extent of the terrace deposits is shown on the geologic map (Pl. 1). Their thickness and character are shown on cross sections in Plate 2 and are described in logs of test holes at the end of this report. Broad smooth terrace surfaces interrupted by a relatively narrow flood-plain belt characterize the Solomon Valley (Pl. 9A). The terrace deposits along the Solomon Valley are continuous with the terrace deposits along the valley of North Fork, where the level upper surface has been called the Kirwin Terrace (Leonard, 1952). The Kirwin Terrace is the most prominent physiographic feature in the Solomon Valley, and the underlying deposits constitute the most important aquifer in Mitchell County. The width of the Kirwin Terrace ranges from about 1 1/2 miles in the western part of the county to slightly more than 3 miles in the eastern part. The height of the terrace above the alluvial flood plain is about 15 or 20 feet. Narrow prongs of the Kirwin Terrace extend into the valleys of the larger tributaries. The Salt Creek valley is characterized by broad smooth Wisconsinan terraces consistent with the Kirwin Terrace and entrenched by a narrow channel of Recent age incised very little into the older alluvial deposits. Plate 9--A, Kirwin Terrace in Solomon Valley, northeast from NW sec. 27, T. 7 S., R. 7 W. B, Kirwin Terrace scarp, NE sec. 33, T. 6 S., R. 9 W.
The deposits underlying the Kirwin Terrace represent a single cycle of valley cutting and filling during late Wisconsinan time, but minor terrace scarps on the terrace surface suggest a complex of several partly developed episodes in the closing stages of the terrace cycle. The more recognizable breaks (Pl. 9B) in the terrace surface--where a flat terrace surface drops to a slightly lower level--are shown by dashed lines on the geologic map. The presence of distinctive humic bands in the upper part of the terrace deposits further indicates short periods of surface stability. Test-hole data show that, in general, the terrace surface in the Solomon Valley is underlain by about 45 to 60 feet of unconsolidated deposits in the main part of the valley fill. The Cretaceous bedrock beneath the terrace fill is overlain by moderately well sorted gravel grading upward into sand and gravel, which in turn grades upward into fine sand and silt. Clay lenses are common within the terrace fill, and the upper part of the terrace deposits consists of clay, silt, and sandy silt. Gravel within the terrace deposits is predominantly from the Rocky Mountains, derived secondarily from the Ogallala Formation to the west. Also present is a small amount of chalky limestone gravel derived from eroded Cretaceous rocks. The terrace deposits fill a well-developed valley, which is cut considerably below the older stream deposits of the Crete Formation of early Illinoian age along the valley margins. The Peoria Formation of the Sanborn Group, which mantles the upland and its slopes, is seemingly truncated along the valley walls. That the terrace deposits of the Solomon Valley are relatively youthful is exemplified by the relation of the terrace deposits to the channel of Solomon River. Meanders are incised into the terrace surface from a meander belt that is not fully developed. At many places along Solomon River, peninsulas and islands of terrace deposits extend into meander loops of the stream (Pl. 1). As the meanders move downstream, they will cut off the peninsulas to form islands, which eventually will be removed completely. In a short span of geologic time, a meander belt of uniform width without projections of terrace deposits will be established. Water supply--Wisconsinan terrace deposits constitute the principal source of ground water in Mitchell County. The relatively coarse sand and gravel in the lower part of the fill of the Solomon River valley is fairly permeable and lies below the water table. The broad flat terrace surface also constitutes a large recharge area. In addition, many small streams that drain adjacent uplands and that flow only after periods of rainfall do not have channels across the terrace but fan out and disappear on the terrace surface, contributing water to the ground-water reservoir. Some ground water also moves from the upland into the terrace deposits, contributing to the replenishment of water in the alluvial material. Ground water moves laterally through the terrace deposits and into the alluvium or into the channel of Solomon River. The chemical character of water obtained from the terrace deposits is shown by analyses in Table 5 and graphically in Figure 14. Character and extent--Alluvium of Recent age underlies the flood plain of the Solomon Valley and narrow extensions in the tributary valleys. Recent alluvium is the stream-deposited material that has accumulated since the close of the alluvial cycle during which the broad Kirwin Terrace was formed. The alluvium occupies channels cut into Wisconsinan terrace deposits. As most of the alluvium was derived from the terrace deposits it is similar in composition to the terrace deposits and consists predominantly of coarse sand and gravel. Because of the similarity of the unconsolidated deposits in the tributary valleys, the separation of alluvium and terrace deposits is difficult, and alluvium along the smaller streams could not be shown at the mapping scale used. In places the alluvium and terrace deposits of the small tributary streams grade headward into colluvium, slope wash, and eolian silts of the Sanborn Group. Thus, the alluvial contact in the tributary valleys is arbitrary, and in the upland areas the contact between the area mapped as terrace deposits and the area mapped as silt deposits of the Sanborn Group also is arbitrary. The areal extent of the alluvium is shown on the geologic map (Pl. 1). The precise thickness of the alluvium is not generally determinable, but the inferred thickness at several places is shown on cross sections in Plate 2. The Recent alluvial flood plain along Solomon River is about one-fourth mile to nearly a mile in width. The surface of the flood plain is about 10 to 25 feet below the level of the Kirwin Terrace and about 15 to 20 feet above the normal water surface of the river. The Recent alluvium fills a narrow valley cut into the terrace deposits and represents a single cycle of cutting and filling. It consists of gravel and coarse sand grading upward into fine sand and silt and represents a reworking of the older alluvial material. The alluvium in the valleys of tributary streams is representative of the bedrock making up their drainage basins and consists predominantly of fragments of bedrock material mixed with stratified deposits of clay and sandy silt. For the most part, however, the larger tributaries contain in their lower parts fairly coarse alluvial material, mostly below the water table. Such deposits constitute sources of moderate supplies of ground water. Cross section C-C' on Plate 2 shows the character of deposits across Limestone Creek. Water supply--Along the Solomon Valley there are only a few wells in the area mapped as alluvium, as it is subject to frequent floods. The alluvial deposits are an important potential source of ground water, however, and wells penetrating the alluvium can be expected to yield adequate amounts of water. The alluvium of the smaller streams contains less sand and gravel and more silt and clay than that of the main valley, and has a lower transmissibility. In the upland, the thin alluvial material of the minor tributaries constitutes a poor aquifer, but in places it is the only source of ground water. Chemical analyses of water from wells in Recent alluvium are given in Table 5 and are shown graphically in Figure 14. Placed on web June 16, 2009; originally published April 1959.